What The Health, this doc is another game changer. 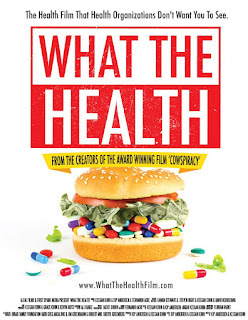 Just as Forks Over Knives tapped into the mainstream consciousness, so too is this film. From the guys who brought us Cowspiracy, comes in my opinion, a better doc on the reasons to go not only vegan, but plant-based. This film dives head on into the hush, hush relationship between our government and big business. If you thought the government had your best interests in mind, think again – you being sick is big business. If you thought Susan G. Komen, the American Heart Association, the American Diabetes Association and the American Cancer Society were on the side of helping sick people, you’re in for a rude awakening. If cancer, heart disease, diabetes or auto immune diseases are a concern or are already your reality, you need to watch this documentary – NOW! This doc will uncover the “secret” to preventing and reversing these chronic illnesses that plague the majority of the population and spoiler alert, it ain’t drugs & surgeries. The typical big players make an appearance, as well as some new faces.